Note: This event is postponed; please check back for updates! Our 2018 Walk Date Is Set For October 20, 2018! Details Will Be Announced Soon! We are excited to announce that we have partnered with the American Cancer Society to host the Annual Making Strides Against Breast Cancer Beach Walk and Family Fun Day in Myrtle Beach! We are inviting all of our visitors and Myrtle Beach locals to participate at 9 a.m. on Saturday, November 4. Prior to the Beach Walk we will be hosting a “Kids’ .5K Hope Hero Run.” For a $10 donation per child, kids will get a Hope Hero Pink Cape and participate in a fun run lap around the parking lot before the main walk begins. 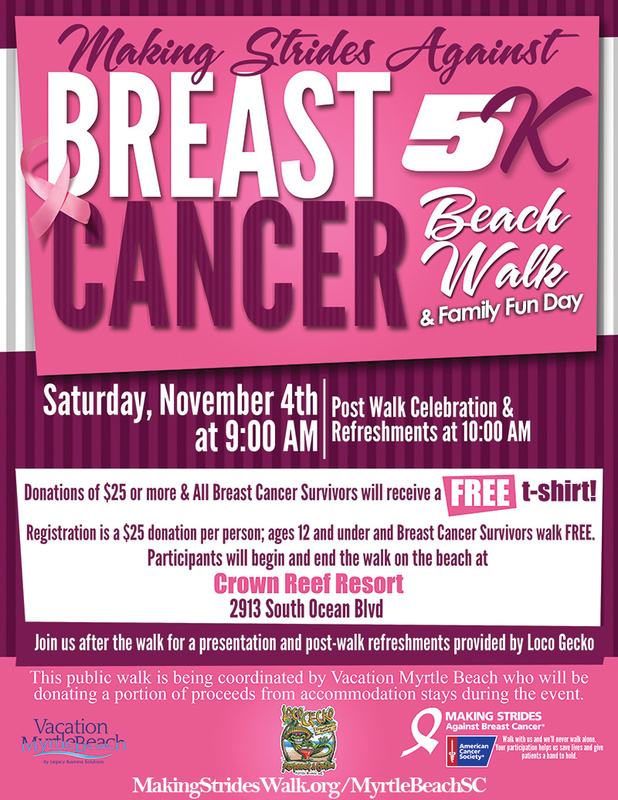 Registration is a $25 donation per person; ages 12 and under and Breast Cancer Survivors walk FREE. Donations of $25 or more & All Breast Cancer Survivors will receive a FREE t-shirt! -Chili Cookoff between the top executive chefs in Vacation Myrtle Beach! We will donate $5 for every guest at our resort who chooses the Making Strides special rate when booking for that weekend. Please come out for a great time and help us support a wonderful cause! Can’t make it to the event but would like to donate? Click the button below! NEW: Our online auction is now open! Hurry, bidding ends at approximately noon EST on November 9, 2017! Visit www.VMBCaresAuction.com to bid now!